Simulations and data analysis need to be at the core of every monitoring process as it enables management to make faster, more informed decisions. 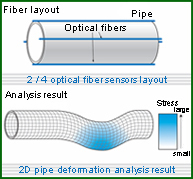 Neubrex Co., Ltd. pioneers in the development of accurate analysis techniques, utilizing the measurement results (strain and/or temperature) obtained from distributed sensing systems by means of optical fibers. 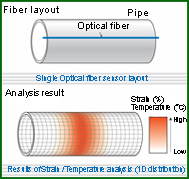 NEUBRESCOPE optical fiber sensing system provides a large amount (typically reaching in single set several thousands points) of highly accurate strain and/or temperature measurements. 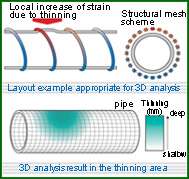 In the analysis process, both measured and calculated strains are used, improving reliability of numerical simulation and helping to detect any undesirable changes in the deformation pattern of considered structure. Moreover, the large number of available measurements data helps in isolating the dangerous portion of the monitored system, leading to global-local analysis, and sub-structuring. This is especially beneficial and efficient in large, full-system analysis such as an entire aircraft, vehicle or ship, and enables incremental and partial assembly solutions. Hence, the Neubrex Structural Health Monitoring (SHM) System combines the measurements of temperatures and strains at remote location, highest spatial resolution and accuracy, and 3D structural analysis tools to monitor and assess the state of the structure. The structural simulation assists engineers in preventing the failures and accidents, further leveraging the costs of deployment. The cm-order spatial resolution and high accuracy of the measurements (never realized simultaneously before) reliability and stability, make the Neubrex SHM a powerful diagnostic tool for assessment of localized hazards.